- Smart DoF (Depth of Field): Automatically optimizes DoF to enhance focus both for near and far objects within camera view. - Digital Noise Reduction: 3D-DNR ensures noise reduction in various conditions. 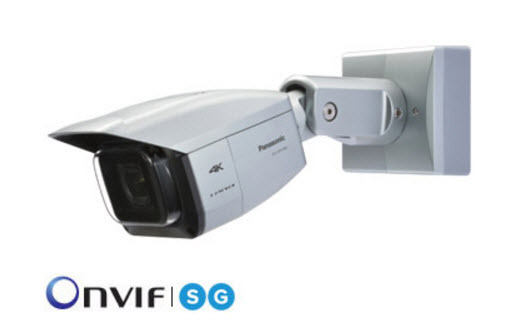 - Smart IR LED equipped: The equipped infrared LED makes it possible to take pictures at zero lx. The IR LED is controlled to match the environment, thereby the camera provides clear images of human faces without white blur. - SDXC/SDHC/SD Memory card slot for manual recording (H.264 / JPEG), alarm recording (H.264 / JPEG) and backup upon network failure (H.264 / JPEG). Realize long-term recording and auto backup function. - HLC (High Light Compensation) technology reduces strong light sources such as vehicle headlights to prevent camera being blinded. - SCC (Super Chroma Compensation) function realizes a better color reproducibility even in low illumination. - IP66 rated water and dust resistant. Compatible with IEC60529 measurement standard, Type 4X(UL50), NEMA 4X compliant.